Last weekend was the annual ‘Open Garden Squares weekend’ run by London Parks & Gardens Trust (www.opensquares.org/). I was asked to accompany my father to one of the gardens, and could choose which one – on looking through the booklet, there were so many that I would have loved to visit – what a shame that the weekend could not last for seven days! The Chelsea Physic Garden it had to be. Founded in 1673 by the Worshipful Society of Apothecaries, the garden was originally established to train apprentices from the Worshipful Society of Apothecaries of London in the use of medicinal plants. Today, it provides just under 4 acres of fascinating, tranquil flora. I have heard excellent reports from everyone I know who has visited, so was keen to see for myself. Easy to get there by tube from Victoria, or a direct bus to the Kings Road from Streatham. The area is divided into clearly defined and well thought out spaces, to educate visitors about the broad range of uses that plants have been put to through the ages, and in the present day, for remedies and pharmaceutical medicine across the world, alcohol production, and musical instruments among others. The garden also features the largest outdoor fruiting olive tree growing in Britain, a living plant amphitheatre, Victorian fern house, Mediterranean plant collections in traditional style glasshouses and the oldest rock garden in Europe. We arrived in time for the Open Squares’ special, early Sunday morning opening. The walk along Chelsea’s streets from our transport had been a treat itself, even on a dull morning the grand villas of Chelsea and open tree-lined streets lift one’s spirits. The entrance to the garden is hidden along a beautiful high brick wall, reminiscent of the book ‘The secret garden‘. Stepping through the heavy iron gates was no disappointment – an immediate feeling of calm tranquility – a secret garden indeed. My lasting impression was one of inspiration – it feels like a plantsman’s garden – created and tended for the interest of the individual plants within it rather than their contribution to impressive or dramatic planting schemes, as at Wisley. But it also feels like a real garden – clearly tended with care and foresight by impressively visionary and knowledgable gardeners, but real in the sense that the plants were healthy, but not all perfect – isn’t that the way that gardening should be going / growing… rather than relying on easy fixes in the form of toxic chemicals at the first sign of something being naturally imperfect? I have read many rave reviews of the cafe and quality of food at the garden – a good place to stop for a cup of tea and slice of cake, if not lunch – it was too early for either yesterday, but the visit to these elegant gardens was itself rewarding sustenance for the mind and soul. If the aim of the garden is to foster a greater understanding and closeness between people and the plants and vegetation that form such a large, if anonymous, part of our everyday lives, then it fulfilled its remit for me. “To forget how to dig the earth and to tend the soil is to forget ourselves”. Mohandas K Gandhi. It’s early June and the Lavender in the garden is full of beautiful tender, silvery-grey new growth. This is an unusual recipe which celebrates traditional British Summer – try this scented shortbread with tea, or as a dessert with fruit compote and rich vanilla ice cream. Prepare a baking tin by lining it with non stick baking parchment. Place softened butter into a bowl and gradually beat in flour and sugar, making sure that the flour doesn’t fly away in dusty drifts as you go. Add lemon zest and lavender towards the end so they are well incorporated but not too chopped up. (If you are in a hurry, or don’t need an arm workout, combine in a food processor). Quickly and gently work mixture together to form a ball. Pat and roll out lightly, on a floured surface. Either use a round cutter or cut squares / rectangles and transfer to baking sheet. Prick on the top with a fork if you like, to decorate. You can also sprinkle with a little sugar. Bake for 20 – 25 minutes, or until cooked. The shortbread should remain very pale. Cool on the tin for a little while then transfer to a wire rack to cool properly. 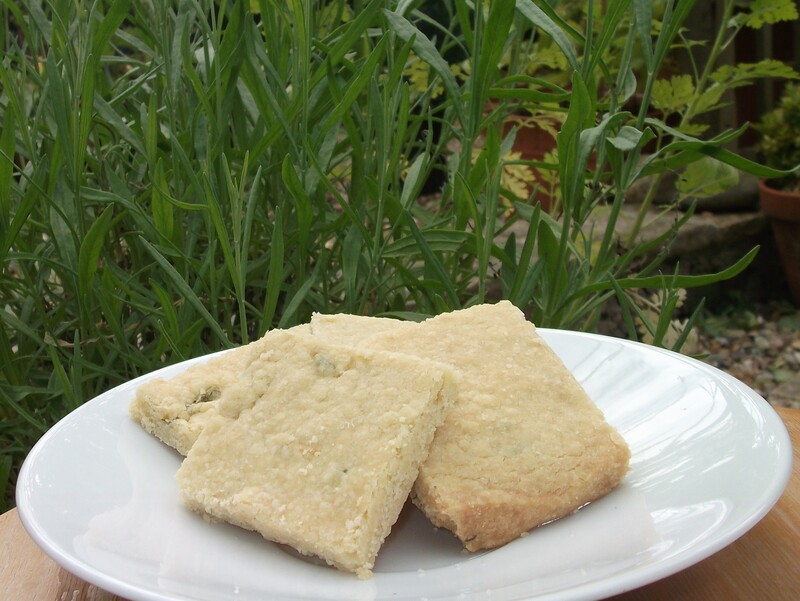 Tip: You can try different flavours of shortbread – vanilla, orange zest, Rosemary and walnut… be adventurous, but keep the flavours subtle. These crispy chocolate chip biscuits are melt in the mouth, thin and crumbly. Really quick to make, they’re great as a light delight with a cup of tea! 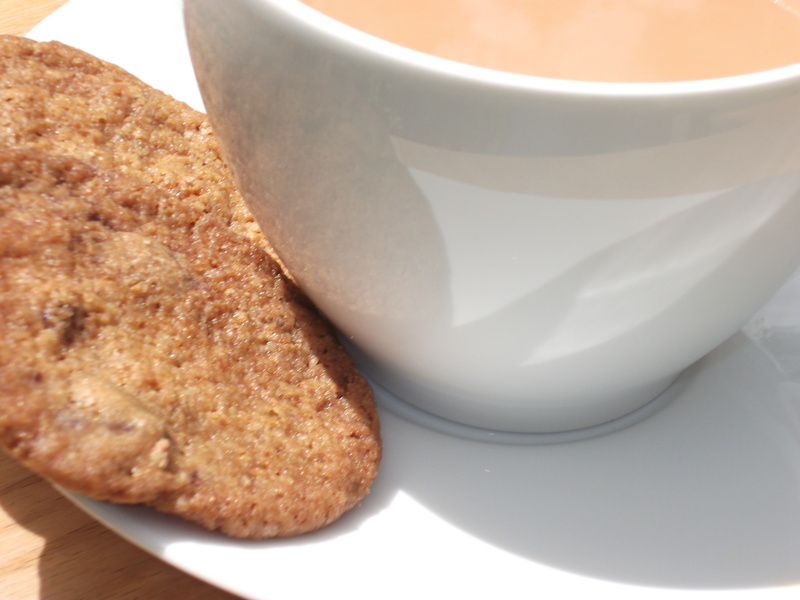 If you want to have thicker cookie type biscuits, chill the dough well before cooking and add 40 – 50g more flour. 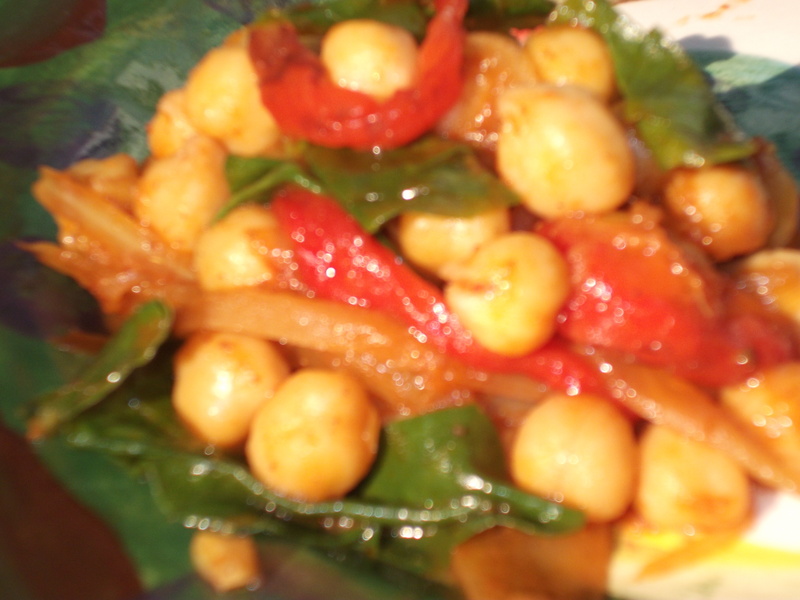 Vary the recipe by adding nuts, rasins, cherries dired apricots, ginger… … experiment. 110g slightly soft butter – if the butter is very soft, you will get very thin cookies, as I did… if you don’t want such thin cookies, see note above. Preheat the oven to 190c / no5 and set the racks to the upper and middle of the oven space. Stir flour, salt and bicarbonate of soda. Combine butter, sugars and vanilla and beat with an electric paddle until just combined. Add eggs, one at a time, beating in between. Gently beat in flour mixture. Very gently beat in nuts and chocolate. Place mounds of dough onto the prepared baking sheets, about 7.5cm apart from each other. Bake in the pre-heated oven for about 12 – 14 minutes. Cool slightly on baking tin, then transfer to wire racks to cool completely. 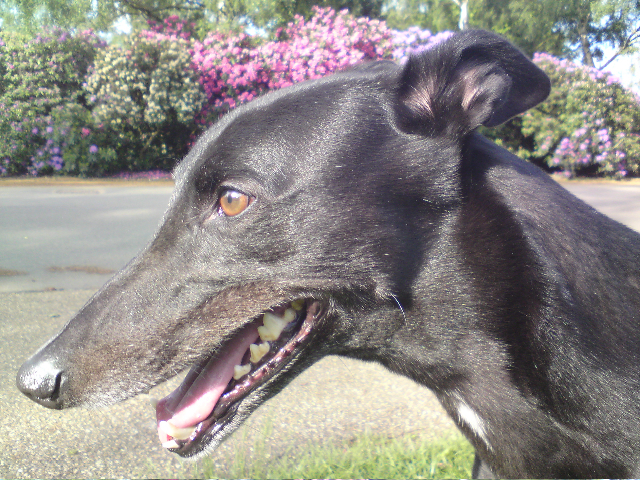 This is a picture of Bozzy, our Greyhound. Dogs – or other pets – can be wonderful companions. Accepting, loving and loyal. Optimistic, un-demanding and ready to enjoy at every opportunity. They listen and support without challenging and are always there to show affection and share time – whether happy or sad. My friend was upset last weekend – he knew that the time to say goodbye to his beloved Border Terrier was quickly drawing closer. She had been gently declining over the past few months. The reality of a final goodbye came on Tuesday. Silly, he said, to feel such loss for an animal. but close friendship, be it with another person or an animal, is a strong tie to break. The void that is left when that being is no longer there can feel immense. But it is not a void. If that person, or animal, has had such an impact on us, then we hold onto something that is left when they go. We are slightly changed as a result of knowing them and shared experiences. Sometimes we can feel let down by those who we invested a lot in, thinking that they would always be around. Other times, for no apparent reason, a friendship just seems to fizzle out. And sometimes, as in this case, people – or a pet – who we have loved and shared with over a long period, may be suddenly gone. What is left are the memories and the impressions that were created by knowing that other person – or pet. It is up to us to make them a positive part of our life. It reminded me of this beautiful poem, which helps me to understand partings. It may be a death, or it may be the break-up of a close relationship that had many hopes pinned on it. Or sometimes it is just that people pop into our lives then drift out again.